Incorporating a synthesizer pedal into your bass's arsenal of sound can be one of the best options available for to you to achieve that special dashed sound that most bassists only get to desire. Thanks to these implements you will be able to explore all the potentialities of your bass, in addition, they are usually very complete, helping to save space on the pedalboard. Most Bass Synth Pedals are useful for both live performances and recordings because they give you more control over your final sound output. Thanks to its 4 knobs that control different effects, you can create with this pedal some really extravagant sounds, limited only by your imagination. If we consider its size it is a very versatile pedal, besides being built to last a long time. The BOSS SYB-5 pedal, manufactured by the reliable BOSS brand, has two inputs and outputs to process two signals at the same time, although under this mode one of them is always active. In addition, the hammers and starts are improved in this version, the ghost notes disappear, but without the expression pedal or TRS, you won’t achieve too much when it comes to power. When you connect the expression pedal –an optional EV-5 pedal is recommended- you will have access to a large number of synthesized sounds, although we recommend that you start with the configuration suggested in the manual. While being an expensive pedal, this Electro- Harmonix synthesizer is at the professional level in performance. The four voices settings –Guitar, octave, sub-octave and square wave- are completely independent and mixable, and they can also be modified to a greater degree with filter sweeping and enveloping controls, which are particularly useful for those who love disco music. The Electro- Harmonix model is capable of performing the work of different pedals, in a single device. On the downside, it is quite big compared to other pedals of this type and does not store configurations, so it is not a good choice for presentations where you need to adjust between songs or aim to switch between double effects. Naturally, you will need to invest enough time to know the operability and capacity of a pedal with so many adjustments and, although it incorporates different functions, it is not a bad idea to own other pedals –Like a compressor, octave, or distortion effect- to combine. 10 sliding controls for a variety of effects, including Trigger, Sub- Octave, Guitar, Octave, Square Wave, Attack, Delay, Resonance, Start Frequency, Stop Frequency and Rate. Excellent track of the notes. Occupies a lot of space on your pedalboard. DigiTech brings to the table a simple but really useful pedal. Thanks to its selector you can choose from V1, which performs an analog synthesis with envelopment sweeps from subtle to extremes; and V2, which provides a synthesis effect that can be used in vocoder emulation or conversation box style effects. It is designed to be used with both bass and electric guitars, so it is ideal for those looking for a versatile synthesizer processor for instruments. 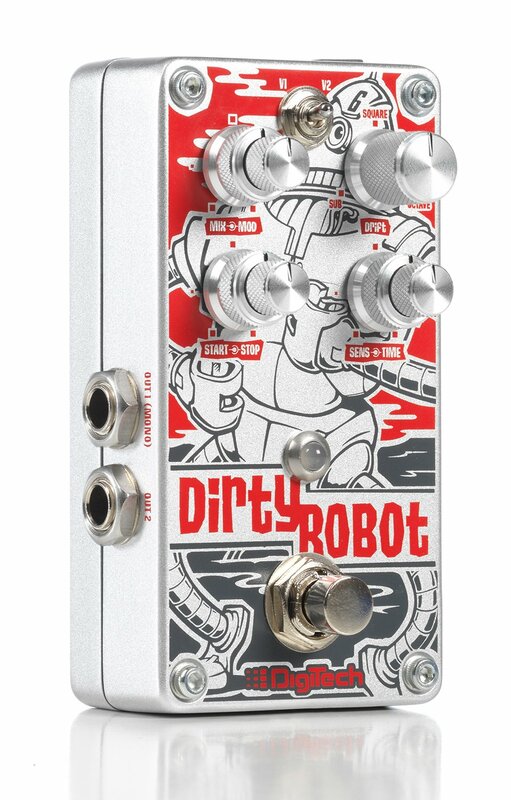 Dirty Robot also has a 360-degree interface to combine Sub, Square, and Octave sound landscapes that can be really useful for techno and dance bass players. This model is overall perfect for those seeking a 12-string sound close enough to the real thing, which can be used in both recordings and live performances, but without the drawbacks that involves using a real 12-string guitar in such situations. On the downside, you will find a slight delay that emulates the natural sound of hitting a pair of strings on a 12-string guitar. Selector to activate two different synthesis modes. Includes Gearlux instrument cable, picks and a connecting cord. The effect may feel a bit unnatural. It does not adapt to all styles of music. Considering its size and price is a very useful pedal, suitable for bass and guitars, keyboards percussion supports and other instruments. Its nine setting options include Obx, Profit V, Vibe Synth, Mini Mood, Ehx Mini, Only Synth, Mood Bass, String Synth, Poly VI. Ach one of these configurations adds a unique set of effect to the final output sound, offering an amazingly wide variety of styles to play with. This way, you can achieve a good sound quality with this pedal. Another advantage of its pre-adjusted settings is that it is ideal for presentations in which you need to quickly switch between one sound and another, saving the time that you would otherwise spend adjusting the tones. In the end, with enough patience to dedicate yourself to explore this device, you can achieve an exceptional and probably unique sound. 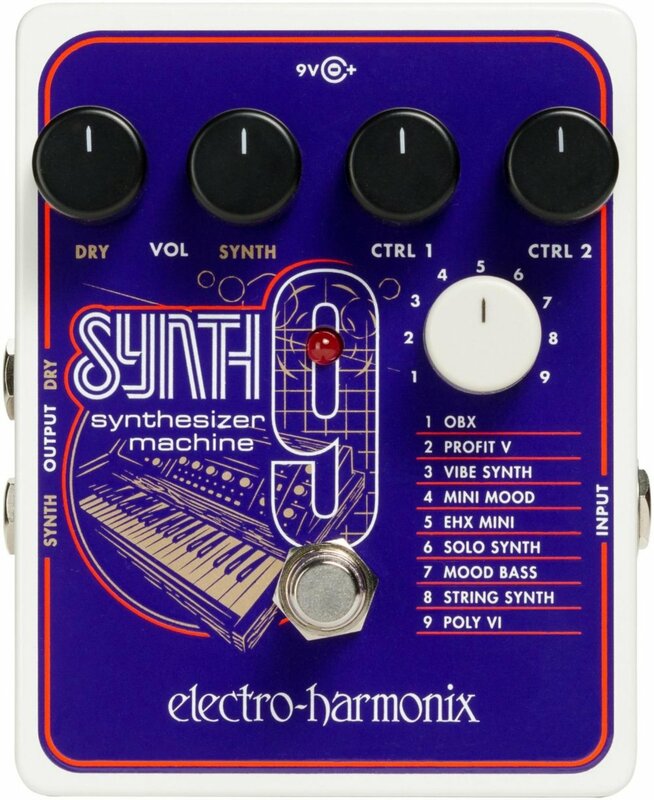 The Electro- Harmonix Synth 9 also includes an LED indicator to avoid activating it accidentally, as well as two independent outputs in “Dry Y Synth”. 9 pre-selectedSynth modes for you to choose from. The CTRL 1 and 2 settings manage additional effects, filters –Like envelope depth-, and voice intervals, among others. It does not offer great durability. Some copies may come defective. 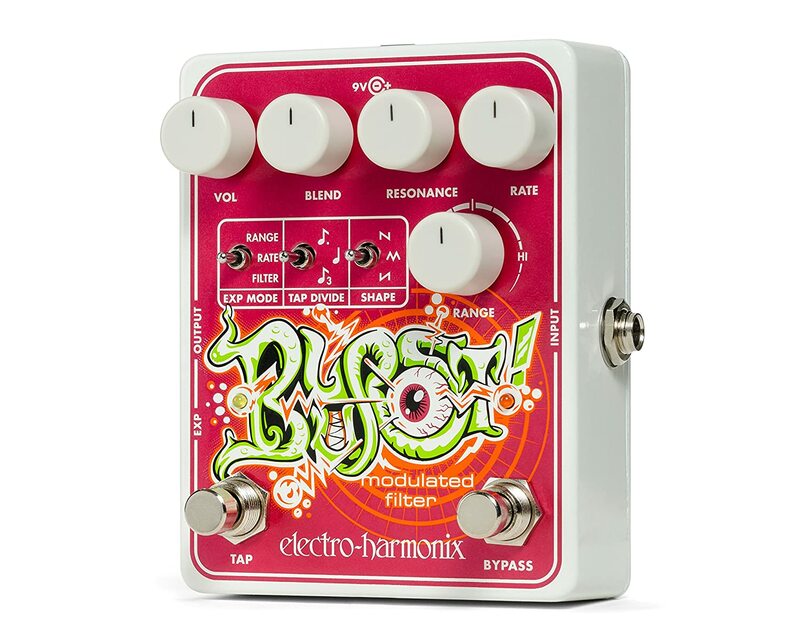 The Electro- Harmonix Blurts is essentially an over-elaborated Tempo pedal. Unlike other synthesizers, this is not characterized by manipulating the notes aiming to get the effect of 12 strings or sub-octaves. It does, however, offer the great attribute of Tempo manipulation, which works excellently, although you will need an expression pedal to get the best from it. This pedal is designed specifically for bassists, guitarists, and keyboard players. It has a low-pass form of modulation wave with adjustable resonance, three analog forms, tap tempo, and a range control rate. The blurts pedal is your to-go option if you are the kind of musician that seeks to experiment with uncommon sounds. It offers the possibility of creating dynamic frequency sweeps. By pressing the tempo and frequency bottoms you can control the speed of the Low-frequency oscillation with this synth pedal, which is an extremely uncommon feature. Besides, despite being made of almost full plastic, it looks tough and has a crazy design. Analog low-pass filter with adjustable resonance. Handles the tempo of the notes very well. You need an expression pedal. Put simply by all the people who have used it, there is no better option than this pedal synthesizer. The number of parameters that can be configured in its 10 memory spaces is ridiculous, which makes it a great option for both live concert and recordings. Established its high quality you need to understand that you require a computer and MIDI input and output connection to be able to use this pedal; without this connection, you won’t have access to its wide range of configurations. In addition to its versatility, the body of the pedal is excellently built and the manufacturer –Akai Professional- has a great customer service given the case that you need technical assistance. As a bass player you already know the Akai brand, well, this pedal monaural type analog-style synthesizer pedal can recreate all the sounds of the Akai Deep Impact –From Muse bass player Chris Wolstenholme-, and even more renowned effects of the Akai brand. 10 memory banks, each with 9 presets and 9 parameters. Free software updates through MIDI connectivity. Free access to the parameter configuration software. It requires a MIDI interface to take advantage of its full potential. There is a danger of editing the factory parameters if you use the free version of the software. Thanks to its rotary controls: Signal Mix, Cutoff Frequency, Resonance Amount and Envelope Amount, it offers several practical adjustments. You can also choose between the 2-pole or 4-pole configuration –To get a brighter or deeper frequency response- thanks to a switch. Another available setting is the smooth and fast envelope follower which adds or removes some sweep delay. This pedal was designed by the renowned Bob Moog brand. It incorporates a genuine Moog filter and an envelope follower to manipulate the dynamic control of filter sweeps. If you are an integral musician, you can try it in other instruments as well. It can be used with bass, keys, guitar, samples, and even previously recorded tracks. The MF101 Moogerfooger is particularly useful for softening the sound because it eliminates high frequencies and, like the best synthesizer pedals, is the holder of an analog system that is very superior to digital circuits because satisfyingly sounds heavy and powerful, behaving differently than any digital counterpart. Comes with a superior Analog system, especially great for hard music. Relatively large and hard to fit in a pedalboard. Thanks to this multi-effects pedal you will be able to adapt your sound to any style of music that you want to generate and regardless of what you may think, its multiple configurations don’t make it any hard to manipulate. The controls of this pedal are almost intuitive, making it perfect for both beginners as for professionals. Its major advantage is that being a multi-effect pedal with so many adjustments available, you can easily replace up to four pedals with it, saving space on the stage or studio –Add to that the fewer meters of cable and getting rid of interference they generate-. 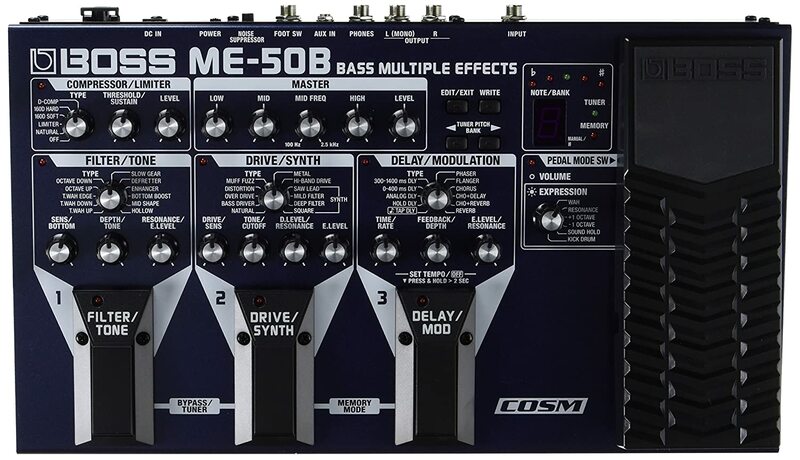 The ME-50B not only replaces other pedals, but it also counts with a resistant body and a great design which will get you a simpler, yet stylish, pedalboard in the end. In addition, you will be able to save your configurations for easier access regardless of when you need them. 3 effects pedal, plus an integrated expression pedal. The configurations can be saved. Having so many built-in pedals can be confusing to operate, it takes time to get used to it. Too much customization can be expensive, you won’t even get to try all the styles. You can only use a BOSS power adapter. 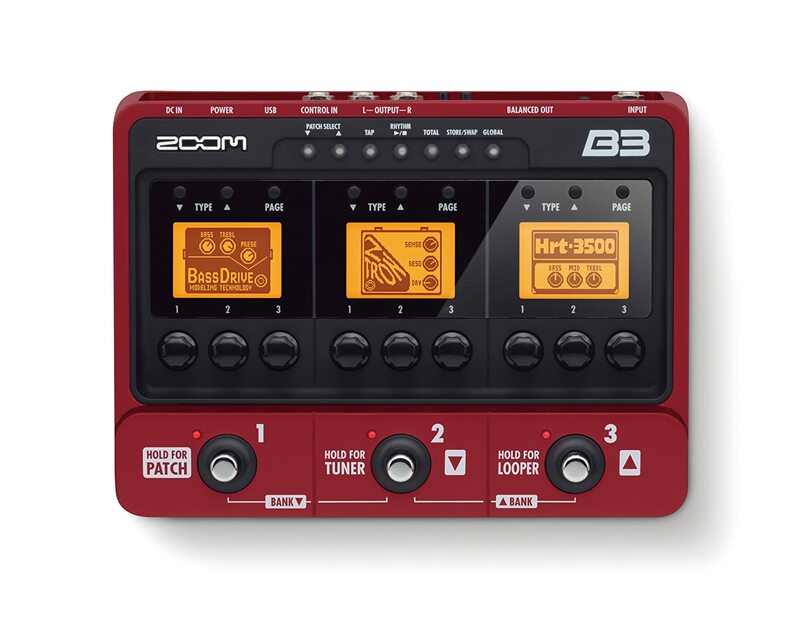 The Zoom B3 is a very versatile triple effect digital pedal, which allows access to more than 100 different effects. Its user interface is very easy to master, so it requires little time to understand its operability and, especially, to store the settings of your preference. Each pedal has its own screen for you to make your adjustments. However, it has some drawbacks, such as occasionally picking up radio signals–This isn’t that bad if you are recording or wearing practice headphones, but can be fatal if the signal is interrupted this way during live performances- and presenting some distortion when paired with more than two other pedals. Three large LCD screens with intuitive interface function. More than 100 integrated zfx-iv DSP effects, to create and store up to 100 tones. USB connectivity to connect to PC / Mac, to record in any DAW. Can pick up radio stations and hinder the sound. The sound, in general, is not so clean. Although each effect has its own screen, none of them has gauges or feedback. The B1on synth pedal offers 75 different types of bass effects and amp models of good sound quality, including Compressors, Filters, EQ octave dividers, Overdrives, Fuzzes, Phasers, Flangers, Chorus, Tremolo, Vibrato, Subwoofer, Octave generator, and defret. All these options can also be combined, creating a massive number of possibilities. You can have active up to 5 of these effects simultaneously, placed in the order that best suits you. 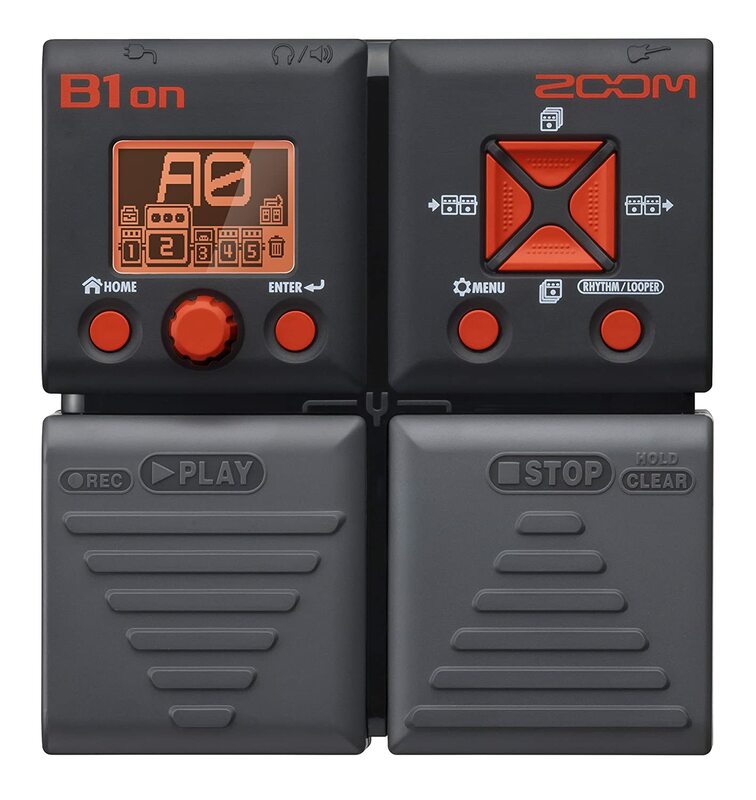 Considering the price, the Zoom B1on although is an amazingly well-done choice with nice sound output, an incredible set of effects and some good power. On the downside, there sometimes the copies generate noise –But you can avoid this with a cleaner effect or editing if you are recording. Up to 5 DSP effects can be used simultaneously. Memory to store up to 100 configurations. Some of the pre-set configurations may sound bad. 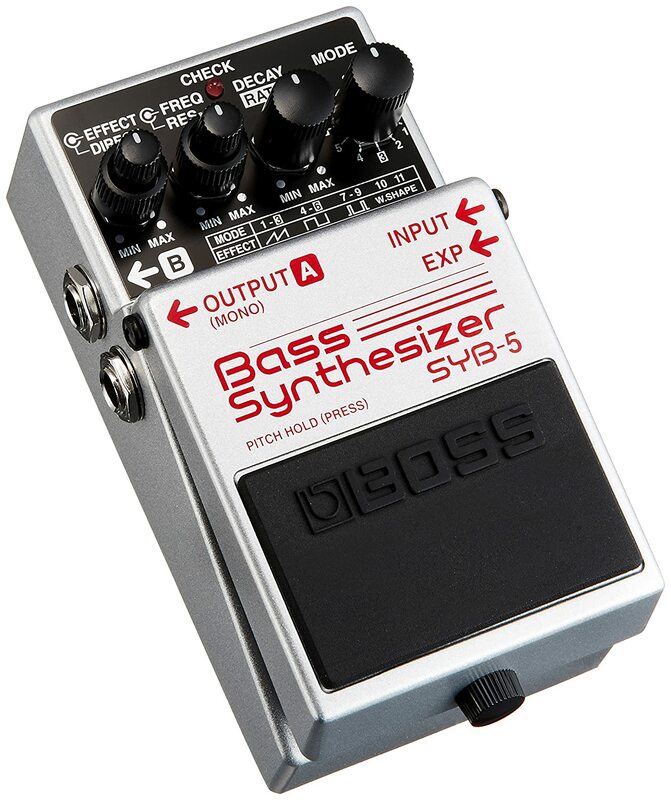 Bass Synthesizer pedals are effects processors that help emulate the sound of a synthesizer. After the activation of the effects pedals, the bass output signal is manipulated by the synth pedal, altering the overall sound. 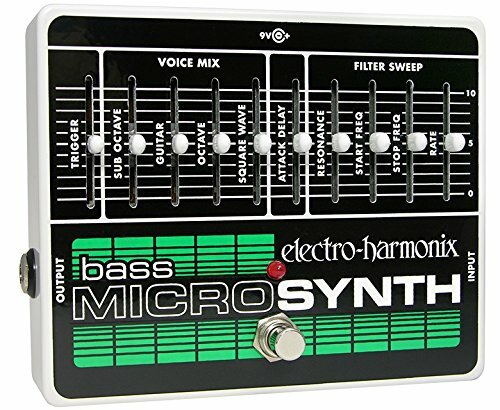 These can be used within a live performance configuration or in the recording studio, although it is possible that a recording studio can reproduce this synthesized sound using the usual equipment, a bass synth pedal can be used as well. If you are running with a low budget, the Zoom B1on is a great device to get started, it offers great maneuverability along with a well-made tool that you can carry for a long time. 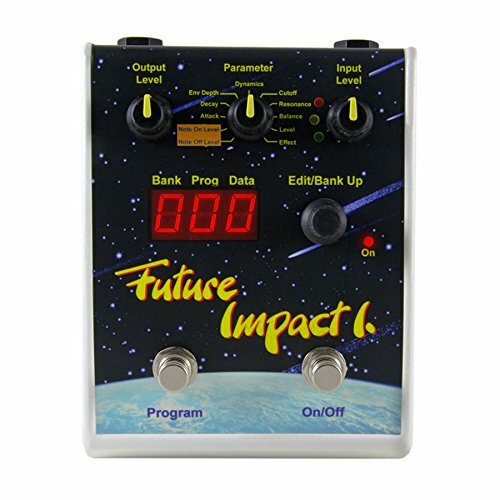 On the other hand, if you are aiming at a 100% professional level pedal, Future Impact is the one to go with. With this piece you will have a handful of options to try on in both live and recording sessions while you can be sure, it is easy to use and will probably last your whole life. We hope this article was great for you! In the end, it is all up to you! The Synth pedal is an amazing tool to get some brilliant and unique effects and getting the one that most suits you will boost your play faster than you can expect.